Thanks to those who have asked me what I am using to strip the paint off, the questions has prompted me to write this review. So I am restoring my car ready for paint. I have been told that we need to see what is under the current paint in order to see if there are any issues. I could grind the paint of, or have it shot blasted. I needed a cheaper solution that is just as good. I have been looking around at many paint strippers and found that many of them now remove the chemicals that makes them work due to “green” issues. So I have been reading about this and decided to buy some. This says that it need to be applied in generous amounts to start the process. If it does not start to bubble the paint reapply and leave for fifteen minutes. Wire wool will help the solution to work more effectively. The mixture looks like wall paper paste with little bits in it. The first thing to hit you is the smell, I was working in an open unit and you can still smell it a week later! This is how this stuff is supposed to smell. In the warmth you can see a fumes haze from the tub. It also makes your eyes water and dry your throat. You must wear gloves, eye protection and a face mask. There are warnings all over the pot for professional use only etc. I normally use a two inch brush but on this occasion I was going into tight areas. I apply it thick and leave it. If applied to thin the it will dry out or evaporate and will not work. When it’s applied you can hear the paint start to crackle and blister almost straight away. I even used this on the under seal to break it down and it worked on that too. I slap a good layer on, and work away from it, then go back to work the first area again then add some more. Even the brush with the stripper on will move the paint around and break it down by agitation. You have to be generous with the application. If you are on a decent paint area it will bubble up and can be scrapped off straight to the metal. Sometimes you need a second attempt for the stubborn bits, I even used a third and fourth coating to get the pig of an under seal off. I found a flexible scrapper was good but some aggressive wire wool gets to work and breaks down the layers of paint at the same time. Again keep the wire wool coated with the stripper to make sure it breaks down the paint. I found even with thick layers of this stuff one gallon done the complete bottom of my car, engine bay and the outside of the inner wings, that was impressive. The gallon seems to go a long way and I didn’t mind the cost for the amount of work it done for me. On decent paint it’s effective and bubbles up. The wire wool or wire brush does the job but watch for splash backs. Even with the latex gloves on you can feel it burn your skin if a splat lands on you. Once is sometimes enough to scrape it all off, if you have to rub down or reapply it does the job well. I found you have to let this stuff soak the paint properly to loosen it and bubble up. The stubborn bits came off with second application. Here are some results of the first coat. The second coat was easier and went to work almost on contact. Better results were achieved on the second coat with the coarse wire wool. I found the the stripper leaves a dirty residue on the metal until it’s cleaned off. For that I used five litres of standard paint thinner to wipe over the surface to remove any left over stripper. This polishes up the metal well and leaves a clean surface to work from. 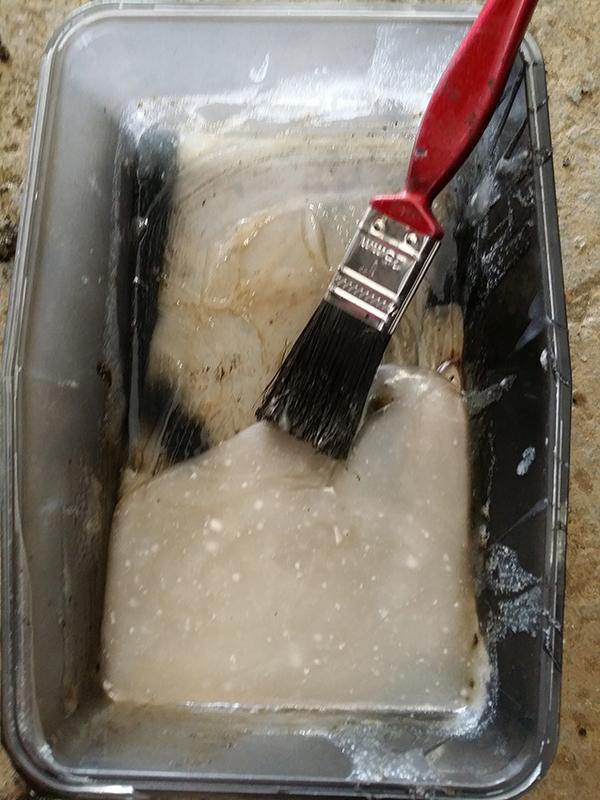 The secret is the thinners to clean up after the worst of the paint has been removed. I will get some comments about the under seal I know, but it worked. I also used it inside the engine bay just for the paint and the process and results was the same. Difficult. I don’t have any other stuff to use or compare to except for POR15 strip which was a half litre can for over half the price! It worked and it certainly done it’s job. I just wanted to do it quicker in one go, show me stripper that will do it in a single application and I will show you a 10 score. My results so far speak for themselves. The stripper I hoped would be a single slap it on and leave for ten minutes, scrape it off and it would be clean fresh metal underneath. It certainly works and removes the paint. It removed the under seal by breaking it down back to it’s tar state to be scrapped off. I was hoping I would be stronger and one application does it all. But this was fifty year old paint and resprayed so it coped brilliantly well. A second coat was norm application, three or four on the under seal, but I was expecting that. This by the far the best stripper I have used so far, and the value for money is brilliant compared to other products and costs. Perhaps I am still hoping to much for a single application I just don’t know. Would I recommend it? – Yes, definitely. Would I buy it again? – Yes, and I did buy a second gallon of it without question. Photo menu – Under the car & chassis – Under seal removal or click here for the hyper link.